We live in a World surrounded by network of networks called the Internet. Today Internet has become the basic need of every human being. By means of Internet we connect to other computers worldwide for sharing information. Every computer or any android device using the Internet has an IP address which uniquely identifies your device on the network. Two device can not have same IP address. By default your IP address is unsecure which means if any hacker gets to know your IP, be it of your computer or android, he can track your online activity and intercept your information before it reach to the desired server and can roll back malicious instructions back to you in order to hack your personal info. However it is also not easy to find one's IP address if you have not shared with anyone, but there are many tools available that can scan your wireless routers to find your IP address, there make, model and configuration settings. If your network is wired then you should not worry much, but being online on a wireless network opens gates to many security risks. But one should not worry much if they are using a dynamic IP instead of static IP. To protect your android IP address, you should use a VPN service. A VPN service is best known for anonymizing your identity on the internet, so that nobody can know your original location. A VPN also provides an encrypted tunnel to send an receive information between your device and VPN server. For this purpose you should use Hide My IP VPN app. What is vpn, A VPN is an extension of Private Network that provides an encrypted security tunnel between your android device and the VPN server to send and receive information, so that no one can pry upon your network activity. A VPN is created by establishing a virtual point-to-point connection through the use of dedicated connections, virtual tunneling protocols, or traffic encryption. Major implementations of VPNs include OpenVPN and IPsec. VPN is best suited for unsecured Open WiFi networks that can compromise your personal data anytime you connect to them. Employees of an Organization should also use the company's VPN in order to access the intranet, to prevent security breaches. VPN services are not free, but they are also not much costly. Cost depends on the type of the device you are using. Currently a popular VPN service is Avast VPN which costs you around $20 per year. Yes it is costly. But if are looking for a free VPN service then Hide My IP android app VPN is the best choice, because it is most easiest to configure, includes an option to use your own proxy server and an inbuilt network data monitor. Currently no app in play store is that much easy to use. Hide My IP is a Free Android VPN app that secures your android phone from malicious threats and phishing attacks by providing an encrypted tunnel between your device and the Hide My IP servers. This encrypted tunnel cannot be forged by hackers or attackers. If they somehow get this encrypted data then they need to run it on Hide My IP servers, for this they have to hack the Hide My IP servers, which is practically impossible, therefore the encrypted information is totally unusable for hackers. So, if you are using this app then you are on the safe side. Download Hide My IP android app. Download Link. After installing the app, open it and tap 'Connect'. A popup will open asking your permission to create a VPN profile on your android phone. Check 'I trust this application' and tap 'OK'. If it does not connect automatically then close the app. Now relaunch the app and tap any of the VPN servers from the list to connect automatically. You can see a key in the android status bar, which indicates that the VPN is active on your android. Tap 'Menu>Verify IP' and open the link in a browser to see your anonymized location and IP address. 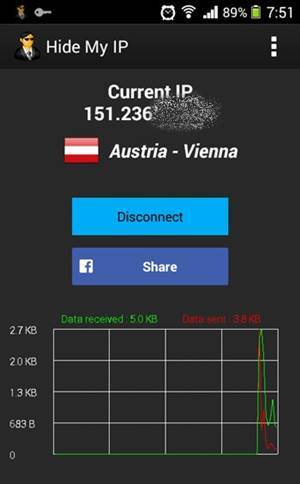 While you are connected to the VPN server you can measure your internet data traffic from within the app. The app shows the received and sent internet traffic data by means of a real-time 2D graph. To enable the network meter graph, just open 'Menu>Show Graph'. However you can view the network speed, downloaded and uploaded data details in status bar without enabling the graph. You are given an option to setup your own proxy server, if you think that the proxy server is much more secure. To enter the proxy details just tap 'Menu>Settings'. Here check the 'Proxy Setup' and enter the 'Proxy Host', "Proxy Port", 'Username' and 'Password'. Finally tap 'Save'. You can choose which internet protocol to use for the VPN connection either TCP or UDP. UDP is faster than TCP because it does not check for packet errors. But TCP is more reliable. Its your call which protocol to use. but by default you should use 'TCP'. To select go to 'Menu>Settings' and select your desired protocol. 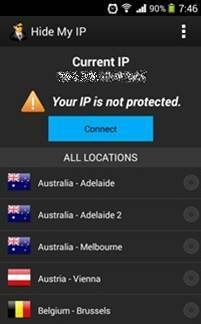 The Hide My IP pro version provides lifetime access to all VPN locations. To buy the pro version just follow the steps below. Open 'Menu' and tap 'Upgrade'. Choose a payment option either 'Google-in-app Purchase' or 'Buy on hide-my-ip.com' and tap 'Continue'. Enter your credit card details to checkout. Also do not forget to mention your email address where you will be receiving your license code. After getting the license code. Go to 'Menu>Unlock'. Enter license code. Now you have a lifetime access to all VPN locations. 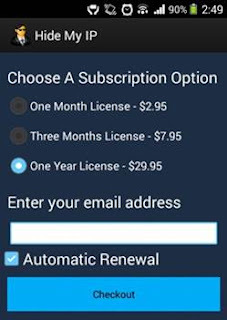 You can buy 1 month license at $2.95, 3 months license at $7.95 and lifetime license at $29.95. Note : If you are not seeing any 'Upgrade' or 'Unlock' option in 'Menu' then you can not buy the pro version, because it may be totally free in your country for a limited time. Also you can use all the VPN servers in the app free of cost. Easy to use, connect and configure. Provides a wide range of high speed VPN servers without compromising network speeds. Provides an option to setup own proxy server. Currently no other android VPN app have this feature. Have an inbuilt network meter. This feature is also not found in other apps. Protects your online identity and secures your activity even on public open Wi-Fi. You have an option to choose between 'TCP' and 'UDP' protocols for your VPN internet connection. It is totally free from ads. There is no limit of time, speed and bandwidth. There is no registration required and no personal information is asked by the app. http://stephaniefulke.blogspot.com /2015/09/hide-my-ip-best-vpn-software-for-mac-windows.html" target="_blank">Hide My IP VPN app for android is the best app for anonymizing your identity on internet. The app is light weight and can be configured quickly. Unlike other VPN apps that require your email or Google+, Facebook or Twitter profiles, Hide My IP works without registration this makes this app more customer centric as we are not forced to share our personal profiles. The app does not slow down your internet speed and provides a great free VPN solution for your android phone and tablet. I have previously used http://stephaniefulke.blogspot.com /2015/05/download-avast-secureline-vpn-for-android.html" target="_blank">Avast SecureLine, and http://stephaniefulke.blogspot.com /2015/06/opera-max-for-android-free-mobile-data-management-and-vpn-app.html" target="_blank">Opera Max both of them are good. But Hide My IP is the more reliable VPN app for android because it does not crash, does not stop working after 7 days like Avast SecureLine and does not slow down your network like Opera Max. This is the best android VPN app that you can install on your phone without any issues in order to get the best network security and anonymizing your IP address. we feel the information Hide My IP - Best VPN Android App To Anonymize Your Identity that's all. hopefully the information Hide My IP - Best VPN Android App To Anonymize Your Identity that we have conveyed can provide benefits for you and all visitors of this blog, if any criticism and suggestions please comment. you just read Hide My IP - Best VPN Android App To Anonymize Your Identity if this article is considered useful and you want to bookmark and share it please use the link https://stephaniefulke.blogspot.com/2015/08/hide-my-ip-best-vpn-android-app-to.html and what if you want other information look for another page in this blog.